The Julep Maven is a monthly beauty box subscription that primarily features nail polish. Their online store also features makeup, skincare and other beauty. Like most beauty subscriptions, you begin by completing a quiz which helps determine your beauty style profile. I completed the quiz and was deemed Classic with a Twist, which I actually feel is fairly accurate. "An elegant beauty with a timeless aesthetic, you bring your natural palette to life with sophisticated textures, patterns, and splashes of color." Once your style is identified you are provided with the contents of your first box. Others may prefer the surprise of not knowing, I personally love the fact that you can see what will be in the box and then decide if you'd like to pay for it or not. If you do not like the box picked for you, you can view the boxes for the other styles (Boho Glam, Bombshell, It Girl, or Modern Beauty) and switch if you choose. The boxes also have a choice of just nail polish, nail polish and a beauty product or just beauty products, so you can customize what you will receive. The monthly box is $19.99 plus shipping and promises over $40 worth of products. You can purchase a single month or in 3, 6, or 12 month increments. Once you are a Maven you receive 20% off all products and free shipping on any additional orders. You can try your first Maven box for free using code FREEBOX. Julep nail color in Zora (left) and Myrtle (right). Myrtle is a deep, cream red, while Zora is a very light pearly pink with a frosted finish. I liked Myrtle a lot, it really is the perfect, classic red. I am not typically a fan of frosted or shimmer finish, however I didn't mind Zora (especially as just an accent). The nail color applied smoothly and achieved full coverage in one to two coats. They also both wore nicely, I didn't experience chipping with either during the week that I wore them. The only downside to these colors is the amount included in the bottle. All colors come in a 8mL (0.27 Oz.) bottle, which is about half the amount in OPI (0.5 Oz) and significantly less than Essie (0.46 Oz.). Because there is less polish, it can become goopy quicker than others. As you can see in the picture of the two bottles, just painting eight of my nails once I have already made a significant dent in Myrtle. A higher price coupled with less product makes Julep quite expensive. 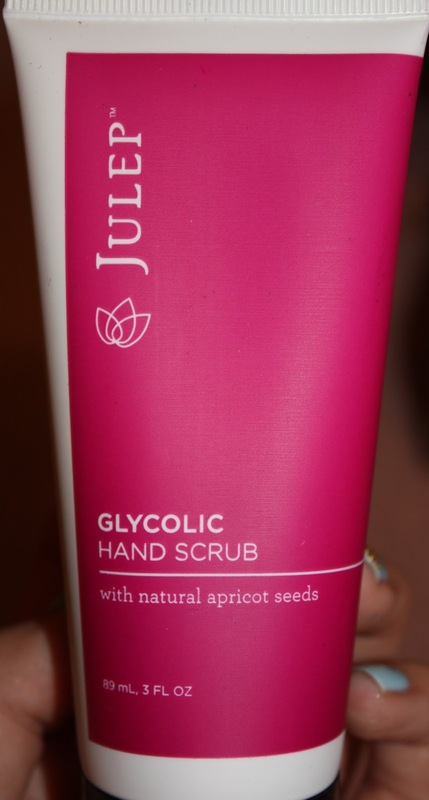 As I do not have rough or dry hands, I have yet to use the Glycolic Hand Scrub. I will probably just end up using it as a regular body scrub. The scent is a light apricot. On the Julep website each nail color retails for $14 plus shipping or, if you're a Maven, $11.20 with free shipping. The hand scrub is only available on their website at $23 plus shipping or $18.40 for Mavens. The entire box is available as a Maven for $19.99 plus shipping monthly. The nail color retails for $16 at Sephora.